The purpose of this project is to study the properties of the Virgo Cluster of galaxies and the galaxies that constitute it. We will measure several global properties of the cluster, including its size and mass. We will examine maps of the distribution of galaxies in the cluster and the distribution by morphological type. We will also compute the luminosity function of galaxies that are members of the cluster. With the luminosity function, it will be possible to measure the total luminosity of the cluster. Combined with estimates of its mass, we can compute the mean Mass-to-Light ration of the cluster and all its contents (shining or not!). We can the apply this to the already computed mean luminosity density of the Universe to measure the global mass density of the Universe. The data file contains all the galaxies within a roughly rectangular region around what we think is the center of the Virgo cluster. The columns in the ascii file are labeled with their contents. The galaxies in this file are from the 2 Micron All-Sky Survey (hereafter 2MASS). There are several thousand galaxies in this catalog. RA, DEC are the right ascension and declination in hours, minutes and seconds or degrees, minutes and seconds format. Note that not all the galaxies in this catalog are actually members of the Virgo Cluster! Many are background galaxies (and a few might be foreground). You will need to figure out what the membership is and cull the non members. If redshifts exist, they're the best way, if not, you need to do some thinking. It might be best just to stop at the magnitude limit where you begin to run out of redshifts (radial velocities). A very useful thing to do is to plot the data in various ways. For example, plots of the number or fraction of galaxies without (w/o) redshifts as a function of magnitude can help you decide to what limit the sample is complete. Plots of position on the sky (RA versus Dec) can tell you about the shape of the cluster. Histograms of redshift can tell you about what the dynamics are like. 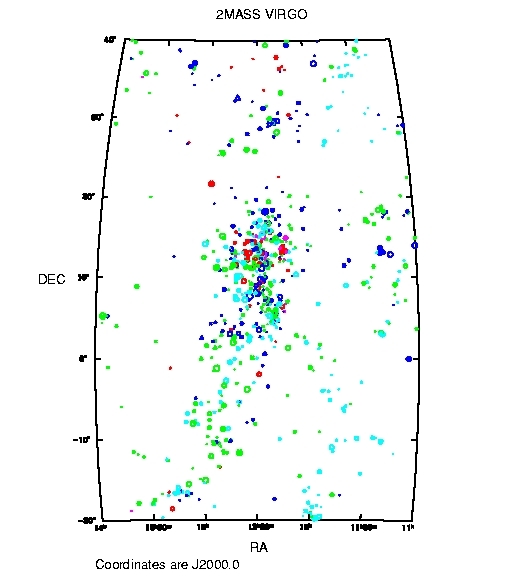 The Figure above shows a map of the distribution of galaxies, color coded by redshift, around the Virgo Cluster adapted from the 2MASS Redshift Survey. if you are logged onto a CfA computer running unix. The data must be in a compact format --- its probably easiest for me to write it in that format for you after you decide which objects are members of the cluster. Or you can construct other software for doing the same thing. Another diagnostic plot is the histogram of velocities for "Cluster Members" in the region, Virgo Cluster Histogram , and another is the full histogram for the region, Virgo Full Histogram . The luminosity function is just the count of the number of galaxies in the cluster of a given luminosity. 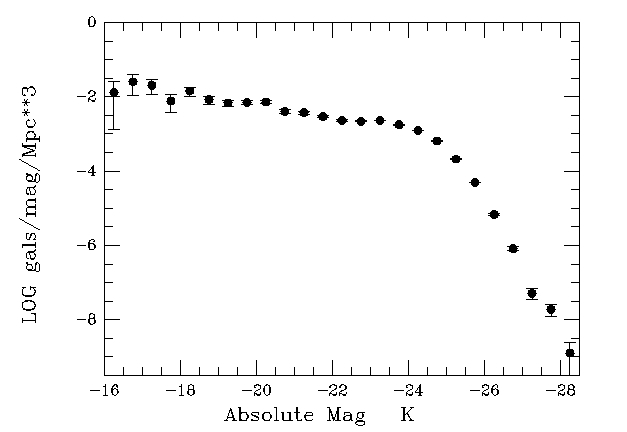 Its usually calculated by counting the number of objects of a given luminosity in a set of bins of luminosity or of absolute magnitude --- astronomers tend to prefer presenting this plot in absolute magnitudes since that's closer to what we actually measure. The figure above is a plot of the field luminosity function from the 2MASS redshift survey. The field LF is usually measured in the # of galaxies per unit absolute magnitude per cubic Megaparsec. This plot looks as clean as it does because there are nearly 25,000 galaxies in the parent sample from which it was derived. For the Virgo cluster, this task is easy, since we are assuming that all the galaxies we have identified as being in the cluster are at exactly the same distance (and in the same place), approximately 16.7 Megaparsecs. In the field, this is more difficult because you need to adjust the volume of space sampled for each bin due the fact that in a magnitude or flux limited sample (with all the galaxies brighter than some limiting magnitude observed) the fainter objects can be seen only to very small distances (so the volume surveyed is small) while the most luminous galaxies can be seen to very large distances (volume surveyed is large). This can be calculated, but it means that you are not exactly measuring the luminosity function in some nice, well defined volume of space. An observational bias! The galaxy luminosity function (LF) is important for several reasons. One, the integral of the LF is the total luminosity of the cluster, i.e. where Ni is the number of galaxies in the ith bin and Li is the mean luminosity of the ith bin. Often astronomers will fit a function to this (usually something called the Schechter function) so as to be able to extrapolate it to both brighter and fainter magnitudes so as not to miss any luminosity. A second use, especially from the derivation of the "field" luminosity function, which is measured in galaxies per luminosity bin per unit volume, is to compute the mean luminosity density of the universe. In that case, since the units of the Field LF are per unit volume, integrating the LF as above gives you the luminosity density. Finally, for the theorists in the audience, the luminosity function is an estimate of the Mass Function of galaxies, a fundamental output of any theory of galaxy formation. One usually gets the mass function by applying a mass-to-light (M/L) ratio to the LF, thus deriving the number density of galaxies (or dark matter halos!) of any given mass. In its simplest form, we assume a constant M/L, but more complete derivations allow for an (M/L) that varies with luminosity or even both luminosity and galaxy type. Even those are likely simplifications. One caution: Remember that luminosities add but magnitudes don't and neither does log(L). Also remember that the absolute K magnitude of the Sun is +3.39. That's what you need to convert to solar luminosities. The mass of the cluster can be calculated from our data two ways, one by applying the Virial estimator and one by applying the Projected mass estimator. I've written a more complete description of these two estimators and of the Virial Theorem from which the first is derived which can be viewed in the following power-point file: Mass Estimators. This gives you the general formula to use in either of these calculations. where Rij is the separation between the ith and jth particle (the limitation i < j is meant to eliminate double counting) and vi is the velocity if the ith galaxy w.r.t. the average cluster velocity. How different are the PM and Virial estimates of Virgo's mass? Well now you have it. With the Cluster Mass and the integrated cluster Luminosity, you can compute the cluster mass-to-light ratio. Note that since the LF was computer in the near-infrared, you have the K-band (2.2 μ) M/L, not the optical. Can you tell how this compares to any other determination in the literature? (Try looking at the NASA ADS). We do have a determination of the absolute luminosity density from the whole survey. So now you can calculate Ω by comparing the mass density you have measured --- assuming all galaxies have the same mass-to-light ratio as the integral of the Virgo Cluster --- to the critical mass density. Go for it! After you do that, however, write down what you think are all the assumptions that have gone into this determination. Are they reasonable? Again, how does your value compare to those in the literature (for gravitating matter, since that's what you measure when you measure the mass of Virgo via either the PM or Virial estimators). You may need to estimate morphological types for the cluster members or possibly look them up in the NASA Extragalactic Database .